Every week for the past year, scores of thousands of Palestinians in the Gaza Strip have taken part in the nonviolent protests called the “Great March of Return.” But how did this groundbreaking movement start? Residents of Washington, DC and five other cities had the chance over the past two weeks to hear the story from the person who launched it through his musings on Facebook, Ahmed Abu Artema. Abu Artema’s presence in the United States was itself an extraordinary happening, given that for the past 13 years the Israeli government has maintained a strict siege around Gaza’s population of two million people, allowing only a handful of Palestinians to enter or exit the Gaza Strip in any given year. 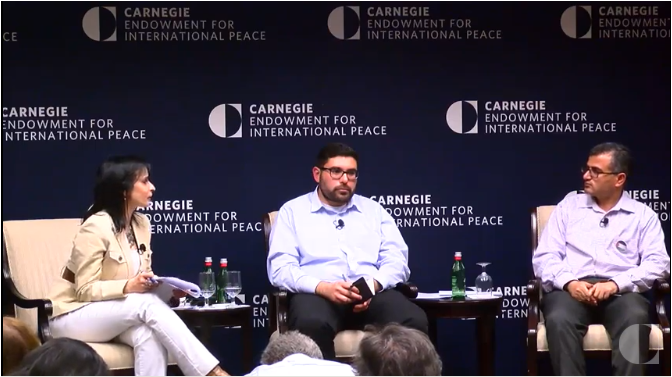 The panel discussion that Abu Artema’s testimony was featured in March 18, at Washington DC’s prestigious Carnegie Endowment for International Peace, was truly remarkable. The Gaza Strip is twice the size of Washington, DC with three times its population. Despite these similar geographic and demographic ratios, it is difficult to imagine more different lived experiences between Palestinians eking out an existence under Israel’s brutal decade-long blockade and residents of the cosmopolitan capital of the United States. Joining Abu Artema at the March 18 event was Jehad Abusalim, a program associate with the American Friends Service Committee (AFSC), who escaped Israel’s blockade in 2013 to pursue his PhD in the United States. The event was moderated by Zaha Hassan, a visiting fellow at the Carnegie Endowment. The panel was part of a whirlwind three-week, nine-city tour organized by AFSC as part of its Gaza Unlocked project, an educational initiative to raise awareness about the impact of Israel’s blockade and advocacy campaign to end it. For Abu Artema, this tour is the first time in his life that he was able to travel outside the confines of the Gaza Strip, one of the most densely-populated spots on earth. Some of the most poignant parts of his and Abusalim’s presentations touched on the themes of liberation from borders and restrictions and the joys of travel, flight, and connection. “There is so much thirst for the outside world in Gaza,” Abusalim explained. “People have been yearning for a long time to leave, to experience, to hear other languages.” This thirst was perhaps slaked to a degree for Abu Artema, as he met thousands of people in the United States from all walks of life at universities, churches, and synagogues, and learned firsthand about the struggles for justice in the United States from Black activists in Detroit, indigenous organizers in New Mexico, and immigration justice advocates on the US-Mexico border. Between 1998 and 2000, Palestinians in the Gaza Strip were able to access the outside world through their own international airport, which was subsequently bombed to smithereens and rendered inoperable by Israel as punishment for Palestinians rising up against Israeli military occupation. Abusalim introduced Abu Artema as someone who writes in a “poetic, yet accessible, way,” an assessment which was evident as Abu Artema shared with the audience the genesis of the Great March of Return through his Facebook postings. Shortly after the Trump administration announced in December 2017 its decision to move the US Embassy in Israel to Jerusalem, Abu Artema went for a stroll with a friend to contemplate the implications of the move and the dire circumstances facing Palestinians in the Gaza Strip. Near sunset, his friend pointed beyond the fence separating the Gaza Strip from Israel, noting the ancestral lands only a few kilometers away from which many Palestinian refugee families in the Gaza Strip came before they were expelled by Israel or fled 70 years ago, never being allowed to return. In his closing remarks, Abusalim stressed that what mattered even more than Abu Artema’s powerful words was what the audience would do with the knowledge they gained from hearing him. As the first anniversary of the Great March of Return approaches, with Palestinians in the Gaza Strip still blockaded under insufferable conditions and denied their right of return, Abusalim offers an important reminder that we need to redouble our efforts to end the myriad ways in which our government enables and facilitates Israel’s oppression of the Palestinian people.